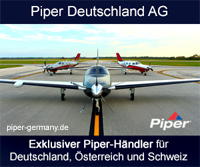 As you already know, we are organizing another Safety Seminar this year together with a Fly-In to Zadar. 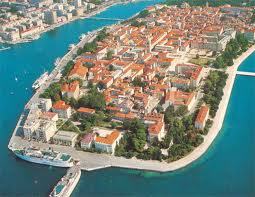 The former capital of Dalmatia has been described as a pearl of croatian culture and history. The historical town centre is on a peninsular, surrounded by a Venetian wall. In 1409 all of Dalmatia was sold to King Ladislav for 100,000 ducats and remained under Venetian administration until 1797. Nearly 2000 years of history have left their mark in this town, in particular in the Old Town, and can also be found in the form of excavations. Our annual Safety Seminar provides us with the opportunity to familiarise ourselves with the Malibu. Once again John Mariani, who was involved in the development of the original PA46, will be our lecturer and trainer. 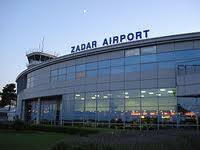 Zadar has a small, modern airport, about 8km south east of the town. Of course we want all participants to enjoy themselves as usual, in superb surroundings and accommodation, with excellent food and drink. 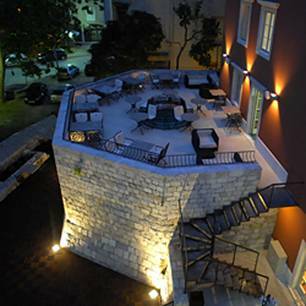 This is being arranged for us in the 4 star Hotel Bastion.. The Venetian Castle dates from 1289 – the remains can be found in the Hotel Bastion and near the surrounding gardens. Opposite the Hotel is the historical Arsenal. Documents from 1289 record the connections between these important buildings, as well as the taking of the town by crusaders in 1242. This place isn't just known as the “Kampo Kastelo”, but also for good food, pleasant living and relaxation. The lively streets of the Old Town and the beautiful promenade are ideal for a stroll and there are shops, boutiques and numerous restaurants to spoil us. 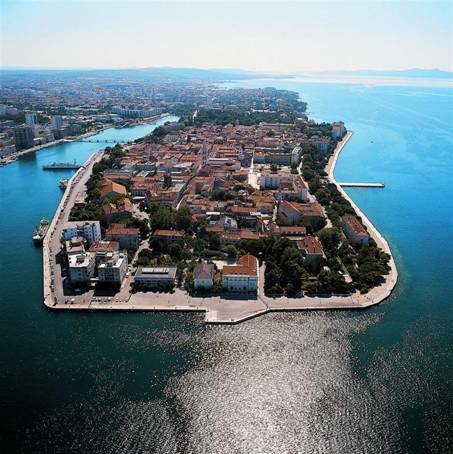 The best-known sights are the Sea Organ, the “Monument to the Sun”, the Archeological Museum with finds from various epochs, St Donat's Church, St Stosija's Cathedral, St Mary's Church and St Simon's Church. 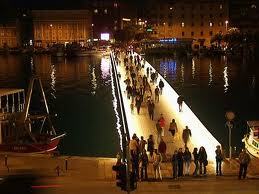 Close to the quay for cruise ships on the promenade is the Sea Organ. This was designed by the architect Nikola Bašić., who was awarded the European Prize for this project in Barcelona in 2006. There were 207 competitors. 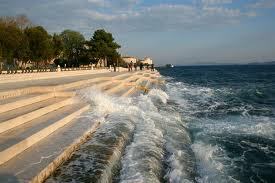 The Sea Organ looks like a coastal formation with steps down into the sea. The steps stretch for some seventy metres along the promenade. Below them, at the lowest level of the tide, there are 35 tubes of various lengths, diametres and at varying angles, rising diagonally to the path and ending in a channel. On these tubes are pipes which play chords of five tones each. Above the channel there are perforated stone steps through which the air is pressed by the sea. Next to the world famous Sea Organ shines another of Nikola Basic's works – the Monument to the Sun - Pozdrav Suncu. The area consists of 300 layered glass plates, which are set into the cobbled promenade in the form of a circle. This has a diameter of 22 metres. The Monument to the Sun was conceived in the form of an amphitheatre. Around this amphitheatre, the planets of the solar system together with their orbits are stylistically represented on stone cubes. 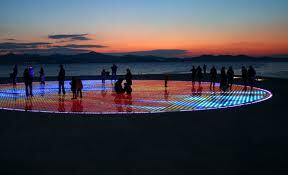 When the “most beautiful sunset in the world” begins, the lights in the circle turn on. These create a very special and beautifully effective display, illustrating the waves and the sounds. There are also lovely national and natural parks. The reserve of the Krka-National Park stretches from the Karst source of the river Krka in the valley of Knin to the bridge at Sibenik. 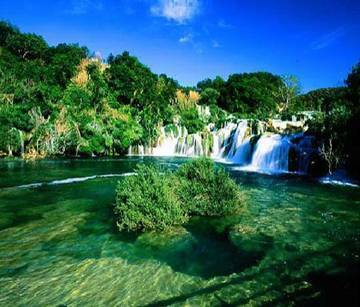 The National Park is 142 square kilometres large and was established to protect the middle and lower part of the Krka. The Krka is approx. 70km long and has cut its way through the mountains like a canyon. The waterfalls at Skradinskik buk are particularly beautiful with a height of 45.7m in the lower part of the National Park! The Skradinski buk consists of barriers, islands and lakes connected by a network of paths and bridges which make a stress-free visit possible. Over 800m the Krka falls 17 steps. There are small basins between the steps, in the lowest of which you are even allowed to go for a swim! 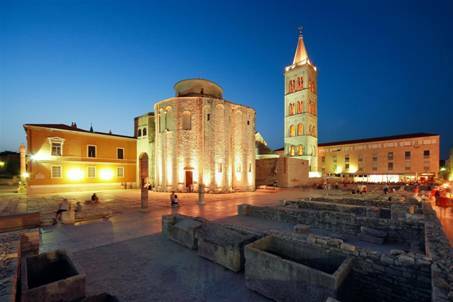 An enriching time together in Zadar – our first visit to Croatia in 2013 – awaits you! All PA46 enthusiasts and anyone who would like to become one are cordially invited to take part in our program as well as in the Safety Seminar. We hope that many of you will be able to join us and we will see you soon!